California farmer B. Johnny Way honors Alutiiq neighbors for upbringing in Alaska. As a youngster, I valued how participating with other people in the community builds trust and unity, which in turn creates a strong and reliable society. Living with an indigenous population and the occasional brown bear for neighbors sounds more like a journal entry from Lewis and Clark than a traditional upbringing. This was exactly the childhood of B. Johnny Way, who spent 22 months on Kodiak Island living with the Alutiiq people and learning from numerous outdoor adventures. Way, author of “Invariable Snow for the Eskimo…” reflects on his unique upbringing on Kodiak Island, from outdoor exploits of fishing for sockeye salmon to visiting the Gulf of Alaska. While these adventures were important to his youth, they were not the only memories that stuck with Way. What truly resonated with him was the kindness and hospitality shown by the Alutiiq people, who never treated him as an outsider. When Way’s neighbor helped him fashion a homemade fishing pole out of a toy kite, he subsequently caught his first fish. 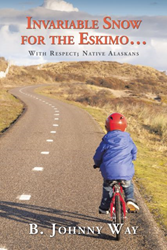 Way said this was just one of many life lessons the Alutiiq people taught him, including the value of respect and helping others. He quickly learned the impact these individuals had on his life and sought to implement these values in his daily life. “As a youngster, I valued how participating with other people in the community builds trust and unity, which in turn creates a strong and reliable society,” Way said. By sharing his childhood experiences, Way hopes to inspire readers to not only harken back to their youths, but also to remind them that helping and sharing time with others is the best reward. “Invariable Snow for the Eskimo…” is Way’s method of thanking the Alutiiq people. B. Johnny Way is a small vegetable farmer in the Sonoma Valley region. An Eagle Scout, Way resides in Geyserville, Calif.